Before we get too far into this post, and in the interests of openness and honesty, I feel it’s best to be straight with you all. I have a Virago. No, I’m not too sure why either. Blame it on Doc Chops and the Classified Moto guys. Or blame it on one too many old bike searches on eBay. Whatever the case, I went on holidays at the end of last year and somehow or other I came back the proud and slightly confused owner of an ’81 XV750. Now I know that some just don’t get it, but for me the real appeal is the breath-taking transformation that these bikes can make with some seemingly simple mods. A few parts dropped here and a few minor mods there and suddenly you’ve gone from lardy Japanese Harley wanna-be to busting some pretty cool custom moves. 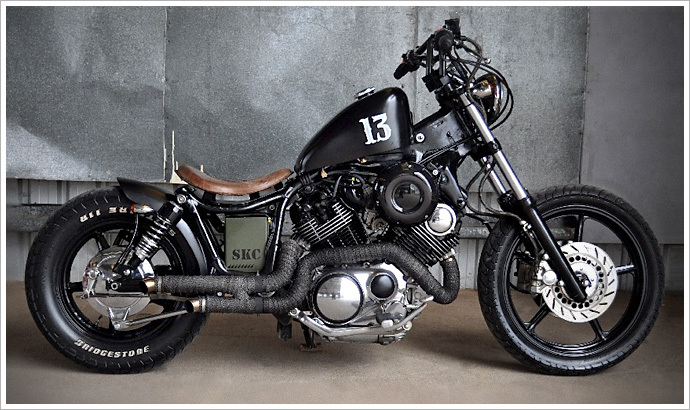 And the Virago you see here, owned by one Ben Rowe, is definitely no exception. Those Transformers ain’t got nothing on us guys.